Today, Golden Frog posted Part 3 - Dump Truck Secure Sharing of their "Welcome to Dump Truck" blog series on their blog. In this blogpost, they cover how to securely share files and folders with the Dump Truck Web App. After you read the blogpost and learn all the features, you can log in to the Dump Truck Web App using your Giganews username and password. Don’t forget that Giganews Diamond accounts receive 30GB of Dump Truck online storage, while all other Giganews accounts receive 5GB of online storage. If you missed the Part 2 of the "Welcome to Dump Truck series", please read Part 2 - Dump Truck Web App on the Golden Frog blog. To stay up to date with the Dump Truck Web App, please subscribe to our blog and follow us on Giganews Facebook, Giganews Twitter, Giganews YouTube Channel, and Giganews Google+. Golden Frog announced today that Dump Truck for iOS is now available in the App Store! Use Dump Truck on your on your iPhone or iPad to securely access your files while on the go. You can also upload your photos and videos from your iOS device and safely store them to Dump Truck. Diamond accounts receive 30 GB of Dump Truck online storage, while all other Giganews accounts receive 5 GB. Dump Truck is free to download and install on your iOS devices. Please remember to use your Giganews username and password to access Dump Truck. To stay up to date with Dump Truck, please subscribe to our blog and follow us on Giganews Facebook, Giganews Twitter, Giganews YouTube Channel, and Giganews Google+. We hope everyone is enjoying the new Dump Truck desktop and mobile apps and the redesigned Web App that were announced two weeks ago. Over the next month, Golden Frog will publish a "Welcome to Dump Truck" blog series to introduce Dump Truck's new apps and features to everyone. Part 1 of the blog series is about Dump Truck Desktop and now available on the Golden Frog blog. P.S. Don't forget to use your Giganews username and password to access the Dump Truck Desktop apps, Mobile apps and Web App. 30 GB of Dump Truck is included free with every Diamond account and 5 GB of Dump Truck is included free with all other Giganews accounts. Check out the latest post about Dump Truck Desktop! New VyprVPN server in Austin, Texas for Giganews members! Golden Frog has added a new VyprVPN server in Austin, Texas USA! The Austin VPN server is available for all VyprVPN protocols, including PPTP, L2TP/IPsec and OpenVPN. For Giganews members using the VyprVPN App for Giganews, the new Austin VPN server address is automatically available when choosing your server location. Last week, Golden Frog updated the VyprVPN App for Giganews to version 1.1! The VyprVPN App for Giganews makes it easy to switch server locations and protocols. United States - Austin, TX New! United States - Washington, D.C.
Giganews Diamond members and members who have added VyprVPN to their membership can immediately take advantage of the new Austin VyprVPN server location. If you're not already a Giganews member, we invite you to sign up. If you are a Giganews member without VyprVPN, we invite you to add VyprVPN to your membership today! Stay up-to-date with Giganews! To keep up with new developments, subscribe to the Giganews blog and follow us on Facebook, Twitter or Google+. The Golden Frog development team updated the VyprVPN App for Giganews to version 1.1. This is a free update for all Giganews members with VyprVPN. Version 1.1 brings a cleaner user experience with several new features and bug fixes. 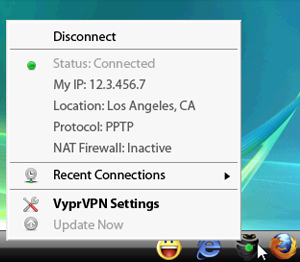 Windows 7 will now only ask for network type (Public, Work, Home) the first time the VyprVPN App for Giganews connects using PPTP or L2TP. Updates no longer require a reboot. Recent connections now work even if a user decides to not save their password. Giganews members with VyprVPN can install the free update directly from the application or download it here. If you're not already a Giganews member, we invite you to sign up. If you are a Giganews member without VyprVPN, we invite you to add VyprVPN to your membership today! Please subscribe to our blog and follow us on Giganews Facebook, Giganews Twitter, Giganews YouTube Channel, and Giganews Google+ to stay up to date on the VyprVPN App for Giganews. The Golden Frog development team released version 1.0 of the VyprVPN App for Giganews today! All Giganews members can apply the update within the VyprVPN App for Giganews or download the latest version. The update includes significant improvements to the user interface, as well as increases in security and performance. Another major improvement for international Giganews members is multi- language support for the VyprVPN App for Giganews. For the complete list of changes and improvements, please read the VyprVPN App for Giganews change log. The VyprVPN App for Giganews Version 1.0 is available for Windows only. Mac and Linux versions are coming soon so stay tuned! Giganews members without VyprVPN are welcome to add VyprVPN. If you're not already a Giganews member, read what Giganews members say about our service and sign up today! As always, please subscribe to our blog and follow us on Giganews Facebook, Giganews Twitter, Giganews YouTube Channel, and Giganews Google+ for the latest news and updates. Over the past year and a half, our partnership with Golden Frog has brought fresh online tools to Giganews members. Today, we're pleased to announce our newest addition, the VyprVPN App for Giganews! The VyprVPN App for Giganews automatically configures and simplifies managing VyprVPN connections. It allows you to easily switch between all VyprVPN server locations and protocols with a simple click. Starting today, it is FREE for all Giganews members with VyprVPN. Download VyprVPN App for Giganews today! The VyprVPN App for Giganews is currently supported on Windows only, but Mac OS X and Linux versions are coming very soon. Please subscribe to our blog and follow us on Facebook, Twitter or Google+ to stay up to date on the VyprVPN App for Giganews. Golden Frog added a new VyprVPN server location in Germany. The new German server is available immediately for all Giganews Diamond members and members who have added VyprVPN to their membership. "Today, we're excited to announce a new server location in Germany! The new German VPN server location increases flexibility to travel the Internet openly and securely around the world regardless of your physical location. We believe in an open Internet and we have continued work to bring VyprVPN customers greater options. For more setup information, please see our VyprVPN setup page or contact our Support Team. If you're not already a Giganews customer, we invite you to sign up today! "Today, we’re excited to announce VyprVPN server locations in France! The French VPN servers are ready for connections for every VPN protocol, including PPTP, L2TP/IPsec and OpenVPN. We believe in an open Internet and will continue to deliver Golden Frog VyprVPN customers more server locations. Golden Frog VyprVPN customers can now access the Internet from anywhere in the world from our French VPN server. If you need setup information, please visit our VyprVPN setup page, or contact Giganews support. If you don’t have access to VyprVPN, upgrade to Diamond or add VyprVPN to your account! New VyprVPN UK Server Now Available! “Here at Golden Frog, we work hard to respond to customer feedback and deliver superior privacy and security solutions in ways that fit with our customers’ changing needs. Since we first launched VyprVPN, the most requested feature has been a UK VPN server location. You asked; we listened. Today, we are proud to announce our new UK VyprVPN server! You can now access the Internet from anywhere in the world and appear as if you are browsing from the UK. This is perfect for British travelers who need to access the Internet in their native language while traveling. Our new UK VyprVPN server adds to our existing server options on the East and West Coasts of the USA, Amsterdam and Hong Kong. The UK server is ready for connections from any of our available robust VPN protocols, including PPTP, L2TP/IPsec and OpenVPN." Today, we are pleased to announce that every Giganews customer, from Diamond on down, can add Golden Frog’s full suite of VyprVPN personal VPN services to their Giganews account, including OpenVPN and NAT Firewall. In March 2010, we announced our partnership with Golden Frog and introduced Diamond members to VyprVPN using PPTP - an older, basic VPN protocol. On February 9th, 2011, we added VyprVPN’s L2TP/IPsec protocol to the Diamond Account at no additional cost. All current members can manage their VyprVPN services through the Giganews Control Panel. New customers can sign up for a Giganews Usenet account to get started. A Usenet account is required to add VyprVPN and NAT Firewall. OpenVPN is the premier VPN protocol designed for modern broadband networks, providing the best speed and stability. Less CPU usage resulting in faster speeds and less latency. NAT Firewall is a packet filter that prevents third parties from exploiting security vulnerabilities. You must add a VyprVPN VPN option to purchase NAT Firewall.